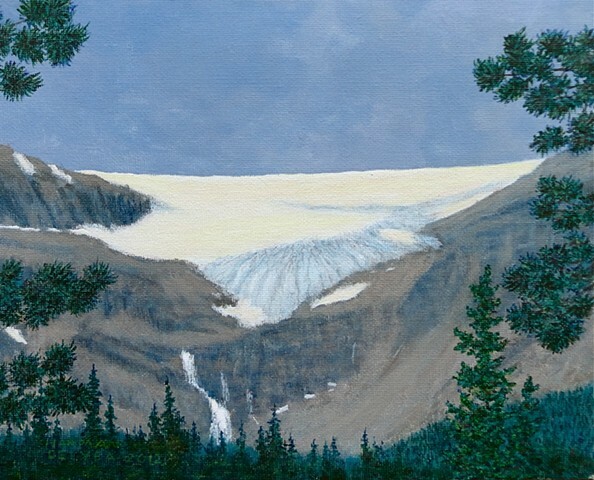 Bow Glacier is part of the Wapta Icefield in the Canadian Rockies. Melt water from the glacier flows into Bow Lake which is the source of the Bow River. A pleasant walk along the shore of Bow Lake and up a stairway brings you to this view. The day was cloudy and yet the glacier glowed. This is what I attempted to capture with my paint and the union of ice, rock and sky.